In your hands you hold the combination of the works of Rayola Kelley and Jeannette Haley. Co-founders of Gentle Shepherd Ministries in 1989, they have striven to make the glorious truth of Jesus Christ and His redemption a living reality to the hearts of His followers. Included in this book are the Gentle Shepherd Ministries Discipleship Course that has been requested and used by people throughout the world, along with Bible Studies, excerpts from sermons, and articles. Every bit of material in this resource of information has been compiled with one goal in mind, and that is to build up and nurture the life of Christ in the members of His Body, the Church.Although some information will seem repetitious, one must be approached from different angles to ensure a sound spiritual foundation and a sturdy structure that clearly expresses the new creation mentioned in 2 Corinthians 5:17. The information and challenges put forth in this book will not only nurture the serious disciple of Jesus, but it will bring a well-rounded understanding as to the fundamental beliefs that make up the Christian faith. 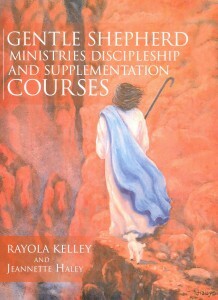 † Listen to Rayola’s Live Authortalk Radio Interview on the GSM Discipleship and Supplementation Course.